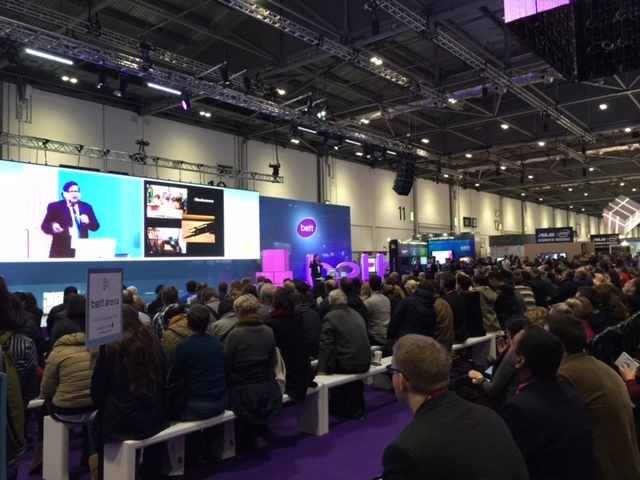 Learning that occurs in spite of the educational system, not because of it, took center stage in the earliest sessions at BETT 2016, the world’s largest educational technology show that opened here today. The idea of letting students’ curiosity and discovery drive their learning echoed in speeches by Sugata Mitra, who is piloting seven Schools in the Cloud that are based on student-directed, online collaborative learning without traditional teachers; and 16-year-old Amy O’Toole, whose experiment as a 10-year-old about bees’ ability to learn was published in a scientific journal. With hundreds of ed-tech products and services on display at BETT 2016—a show that is expected to draw 36,000 visitors and continues through Saturday—the possibility of using instructional technology to give students’ power over their instruction resonates with exhibitors. That’s precisely what many of them are trying to sell to schools and parents around the world. Mitra, whose presentation drew about 500 attendees, said that curriculum and assessment are two areas of traditional schooling that need major makeovers. An educational system that was designed to produce employees who sit and work studiously at desks will not serve a future dependent upon collaboration to solve problems, said Mitra, who first became known in education after he added freely accessible computers to a hole in the wall in a New Delhi slum. Children taught themselves how to use the technology, and progressed by working together—without adult supervision or intervention. As for curriculum, “all irrelevant knowledge and skills need to be removed,” and schools’ curricula should be reviewed and updated every quarter. For example, a geography exam question is, “What is an ox-bow lake?” Knowing the answer, he said, is irrelevant. “‘Just in case’ skills and knowledge should be replaced by the skill of learning ‘just in time,'” he said. “If we had just stuck to the curriculum, I definitely would not be here today,” said O’Toole, a 16-year-old who spoke about how creativity can enhance learning and inspire girls in science. Her private elementary school allowed a neuroscientist, Beau Lotto, to work with students on a study of bees, even though it was not part of the curriculum. In December 2010, the scientific journal Biology Letters published the findings of O’Toole and her classmates, who did research about whether bees can learn. It all started when a teacher asked O’Toole’s class whether they wanted to “train bees to play a game,” based on the question: “What if bees can think like humans, like us?” At first, no one in the world of science took the students’ science paper seriously. But when it was eventually published, the paper was downloaded 30,000 times in the first day, according to O’Toole. “I think we should be given the opportunity to do something amazing, and our current curriculum doesn’t allow us to do that,” she said.